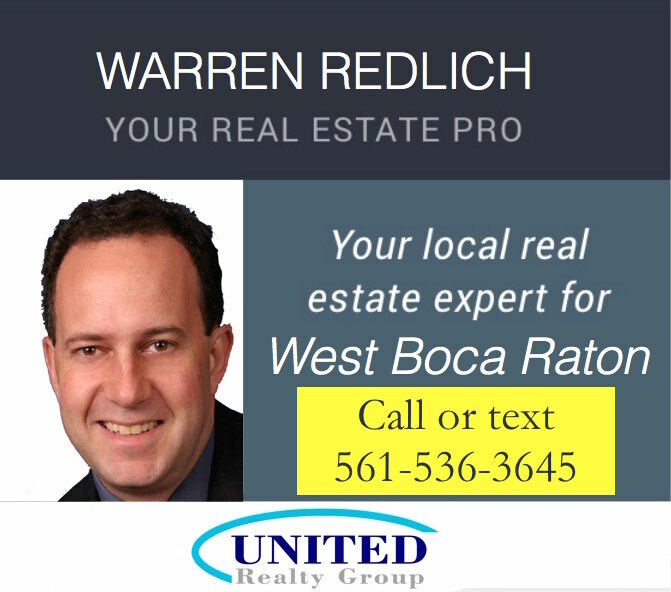 Warren Redlich can help you buy or sell West Boca real estate? Call Warren at 888-733-5299 or send him an e-mail: warren@westbocanews.com. 1. We will feature your home on West Boca News. 2. As an attorney, Warren can give you free legal advice. Non-attorney Realtors can’t do that. 3. Check out Warren Redlich’s resume. Find out more at YesBoca.com. Getting the word out about your house helps bring in more offers, helping it sell more quickly and for a higher price. Some of our readers are potential buyers, and many more have friends and family who are thinking of moving here. No one else can put your house on West Boca News. Running West Boca News provides another advantage. Warren knows West Boca Raton. We cover real estate news of course, but also schools, restaurants and other businesses, events, parks, entertainment, crime and much more. That knowledge helps determine how to price your home for sale, and it means we’re ready to answer buyer questions about your neighborhood and the community around it. Warren focuses on homes listing for $300K and up. Staying on the high-value end of the market means more time working on selling your house, and more familiarity with that end of the market. Of course, Warren focuses on West Boca, along with a small part of West Delray. He doesn’t look to handle homes outside this area. Warren Redlich is an attorney admitted in both Florida and New York. His legal knowledge and academic background can make a big difference in selling your house. Check out Warren’s Resume. Good photography helps attract buyers. Many homes we see for sale have poor photos. Warren uses a professional-grade camera and lenses to make sure potential buyers see the best features of your house. Warren is a Realtor®. This means he has completed additional training, is a member of the Florida Association of Realtors and the Realtors Association of the Palm Beaches, and has access to a wide array of tools including the FlexMLS multiple listing service. Warren is affiliated with United Realty Group, which has an office in West Boca at 5550 Glades Road (near Town Center). Warren is licensed by the State of Florida as a sales associate. You can look up Warren’s license on the Florida DBPR website.